Gel Seat Cushion BUY Foam Cushion, Memory Foam Cushion, Seat Cushion, Gel Cushion, 78710, All Day Gel Seat. Gel Seat Cushions are designed to fit most seats to help reduce lower back pain. This Gel Cushion is compatible with most office seats, car seats, truck seats and stadium seats. The Gel Seat Cushion is made with memory foam and gel to reduce contact pressure and enhance comfort. The Memory Foam Cushion is filled with a soft visco-elastic gel that disperses weight and alleviates pressure to provide more comfort for long seating periods. 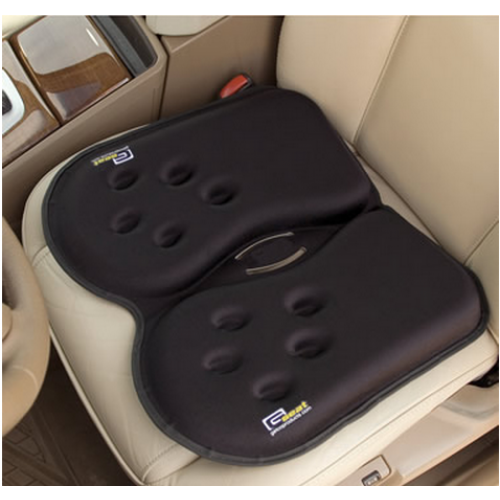 Gel Seat Cushions have a subtle 5 degree slope that promotes proper pelvic posture. This seat cushion also promotes correct lumbar curvature for a healthier back. Ten small indentations in the Seat Cushion allow ventilation for less heat build up. The center of the Gel Seat Cushion has a depression that allows the cushion to easily fold for transport or storage. This depression also removes contact pressure on the tailbone and soft tissue for more comfort. These seat cushions feature an attached handle that aids in transport. Provides ventilation for less heat. Eliminates contact pressure with the tailbone and soft tissue. Adaptable as an Office Seat Cushion, Stadium Seat Cushion, Car Seat Cushion or Truck Seat Cushion. Gel Seat Cushion Product Number: 78710. Construction: Memory Foam and Gel. Take the pain out of your rear. The design of this cushion makes a big difference that my rear can breathe and not get to hot. Hot pants get uncomfortable fast. The soft gel is just an added benefit for me. Give your rear a rest! Since using this gel cushion at the office and in my car, the stress on my back has been reduced significantly. I have more endurance and less pain.